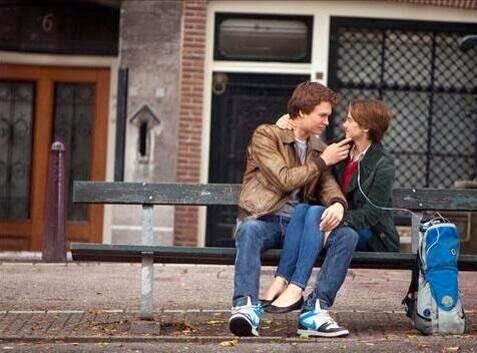 The first still released by no other than Augustus Waters! 2014 is the year that 'The Fault in Our Stars' movie arrives at cinemas, something I am so excited for, as I've got a feeling this will be as close to the book as you can possibly get it. The two year anniversary of the book's release was yesterday, and this means it's a good time to discuss the impending adaptation, since lately, I have been arriving home from school to find movie stills filling my Twitter and Facebook feeds, something I'm not complaining about! The first-look at Shailene Woodley as Hazel and Ansel Elgort as Gus came when the first movie-poster was released, something I can't wait to put up on my bedroom wall. There is a rumour that the trailer for the movie will be released on the 14th Feburary, after a tweet was posted by the directors father(which has been deleted) on New Year's Eve, meaning that we will see it on Valentine's Day! I don't think we'll be seeing the Swing-set scene yet, but here's hoping! The movie poster has had mixed-reactions - not because people are unhappy about the castings for the movie - but because of the controversial tagline. I have a love/hate relationship with the fact 'One Sick Love Story' is written across the bottom. 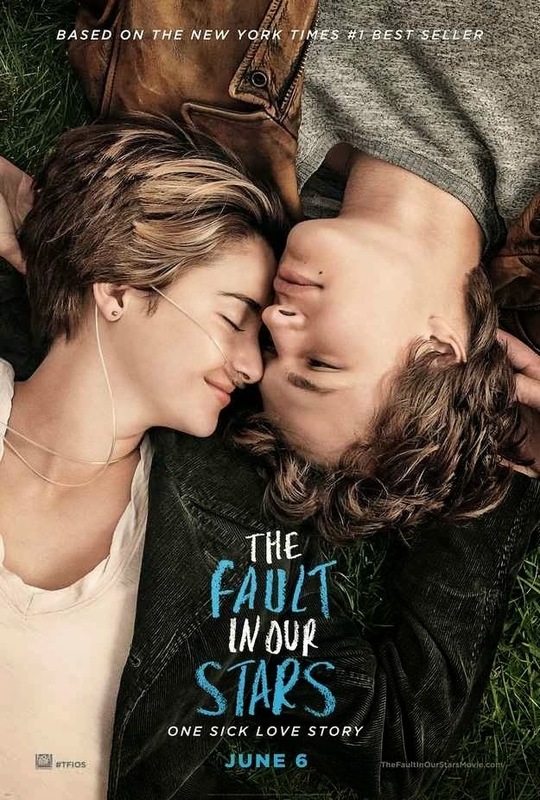 This in no way means I dislike the poster; I think that it's a beautiful way to show the romance between Hazel and Gus, as they really do look in love, while not shying away from illness, because you can clearly see that Hazel is ill from the tubes around her nose. You immediately see where the heart of this movie is going to be, and I love this. Of course, I didn't see the tagline straight away, and when I did I personally had to stop and think about it for a while. John Green likes it - and as the author of the book, he knows when a good decision has been made. My main 'problem' with it, is that people who haven't read the book and are not aware that there IS a book, could find it offensive. Fans know that the book shows much more than two teenage cancer sufferers, it shows that they are just like everybody else and deserve the chance to be in love. Although, If I saw this in the street, unaware of what the message of the book was, I think I would avoid seeing the movie. I would think it was being quite blunt, and trying to make a joke with what should be a careful-topic. I understand it; the main reason it was done was to be shocking, was to make people notice it and not hide-away when the topic of Cancer or illness is brought up, and have you ever seen a movie-poster that has made you think so much? I haven't. One still from the movie appeared on Ansel Elgort's Instagram account(Gus teasing fans! ), another was officially released a few days ago, and it's heart-wrenching. 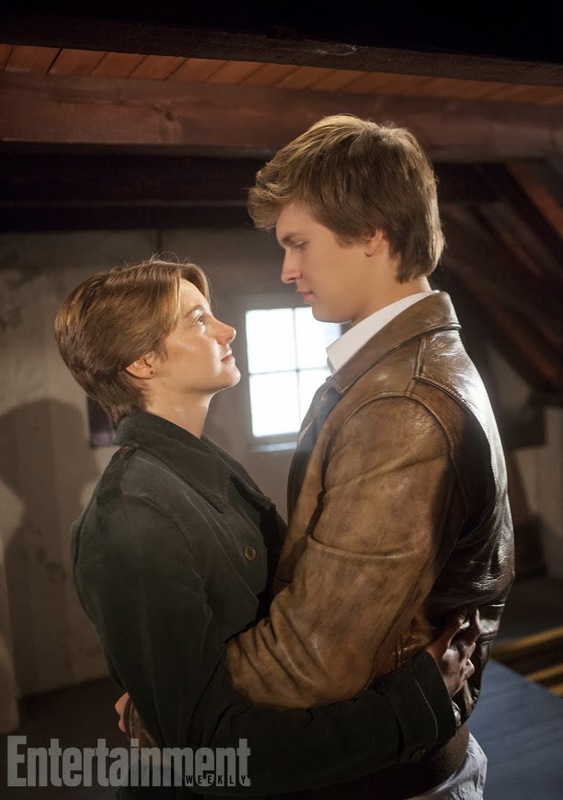 When looking at the still from the Anne Frank House, it's easy to admit nobody else could have the chemistry that Shailene and Ansel portray; they look in love, they look like Hazel and Gus with the simplistic clothing, they look like every-day teenagers walking down the street. The only thing is that Hazel's cannula is missing. The still released by Ansel does show Hazel's cannula, something I'm really happy to see as it's shows that they're sticking to the book on even the smallest details. Anyone else notice the chipped bench and broken-flooring? So, what do you think of the TFiOS poster? Do you have a love/hate relationship with it? What are your thoughts on the stills that you have seen so far? What scene are you hoping will be featured in the trailer on the 14th February, if the rumours are true? ASDFGHJKL I AM SO EXCITED FOR THIS MOVIE! It will be so beautiful and emotional and hilarious and ahh and all of the feels. I feel sorry for the people sitting near me in the cinema! I don't know what to think of the posters. I'll have to admit I don't love the poster but I think it's more the fact I don't want them to screw up such a wonderful book. Bahhh this is so exciting! I'm gonna be a wreck come June. Definitely need to reread it before then! I'm not too keen on the poster, I think John Green probably HAD to say that anyway, so I don't know if he really felt like that - I just feel like there are SO many other taglines they could have chosen. But at least it's sparked controversy, and got more people talking about it, right?! Ridiculously excited to see this film despite that horrific tagline!